Terminal cancer patients in the most prestigious hospital of Mumbai are being murdered under the masquerade of natural death. Why would anyone kill poor cancer patients who are anyhow going to breathe their last in some time? Who can benefit from such a heinous act? Why all deaths seem to be natural when actually they are planned? These are the questions Ashritha, a novel writer who is staying in the hospital to write her book on cancer patients, is struggling to unravel, risking her own life. Initially she shrugs off her suspicion as she finds it illogical, but later the odd incidents going on in the hospital force her to take her suspicion seriously. Challenging all the dangers head on, she digs for the truth and unearths secrets deeply woven within the hospital, with the help of his college friend and CBI officer Animesh. What comes out as a wretched act initially turns out to be a deeply woven plan and a heinous conspiracy. 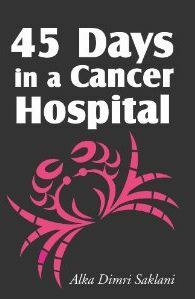 45 Days in a Cancer Hospital is a suspense thriller with a strong female protagonist and a series of shocking events that culminate in a shocker. The story also touches on the life of doctors and cancer patients and is woven around aspiration, love, hatred, betrayal, greed and suspense within the walls of the hospital that takes place during the 45 days of Ashritha’s stay. The author was born and brought up in Vadodara, a city in Gujarat, with her roots hailing from “Dev Bhumi” Uttarakhand. She has done MBA with specialisation in HR from South Gujarat University and Bachelors in Instrumentation from Maharaja Sayajirao University of Baroda. Currently she is working as a Corporate Recruiter in a reputed RPO in Vadodara. She displayed her flair for writing since childhood and has a few published articles and poems in her kitty. She bagged the semi-finalist position in international UK song writing contest for her two poems in 2008. Apart from writing her hobbies include reading, travelling and listening to music. Must to read who love thrills ……one setting through book….it has thrilling situations, unpredictable characters. A real suspense and a real thriller with so many twists and turns that kept me hooked to it until I completed it. I Read this book again to feel the thrill and suspense. awesome writing.